The Midtown Greenway Coalition (MGC), with partner Hennepin County, participated in the HGA Community Design Workshop October 12 and 13 to develop wayfinding system design plans for the Midtown Greenway. MGC applied to the design workshop opportunity on behalf of the Midtown Community Works Partnership and was one of four non-profits selected for the free-of-charge workshop. The MCW Partnership and other partners share a vision, articulated in the 2016 Making the Connection: Midtown Greenway to Lake Street report, for better connecting the communities they serve through a comprehensive wayfinding system. 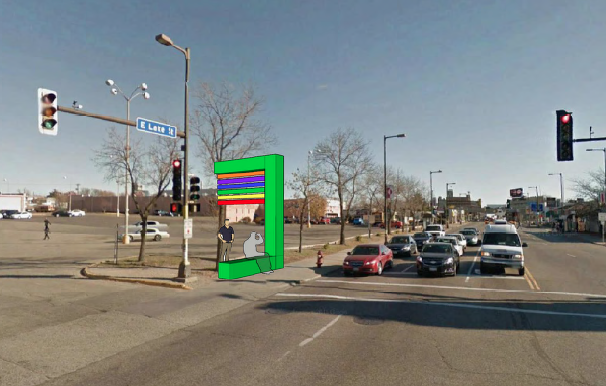 This wayfinding system will be creative, effective, and culturally responsive and will bring new users to the Greenway, Lake Street, Minneapolis parks, and the National Park Service's Mississippi National River and Recreation area. The Design Workshop asked MGC and partners to provide a design goal to an HGA design team tasked with working through feasible options in response to MGC's proposal for wayfinding system design. Although the timeframe to develop design concepts was short, MGC and partners were pleased with the solutions and next steps that HGA proposed. "We were excited about this project and happy to participate," said Soren Jensen, Director of the Midtown Greenway Coalition. "We learned from HGA that having a good, well thought out map of your system to help orient users is an important and practical element of successful wayfinding," commented Jensen. "One immediate application of the materials developed during the design workshop is to update the Midtown Greenway Coalition website with the Midtown Greenway map designed by HGA." 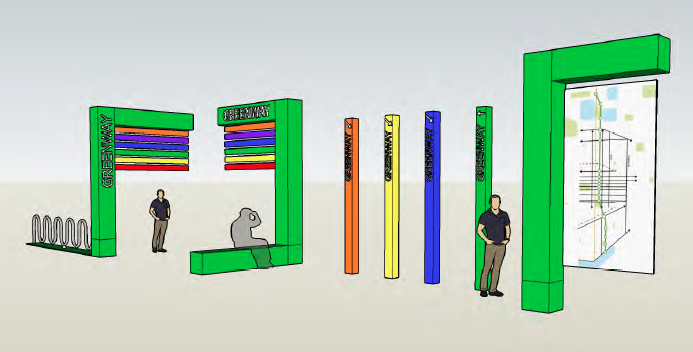 The design charette for the wayfinding system included discussions about branding distinct,tactile signage and wayfinding tools, like signs and maps attached to benches or bike racks. The HGA design team described the signage concept for the system as a hierarchy of signs that are stylistically consistent throughout the whole system. "It was exciting to see some of the wayfinding elements that are included in the Making the Connection: Midtown Greenway to Lake Street report put into context with the designs HGA developed," said Crystal Myslajek, Hennepin County's manager of the Midtown Community Works program, who participated in the design workshop. 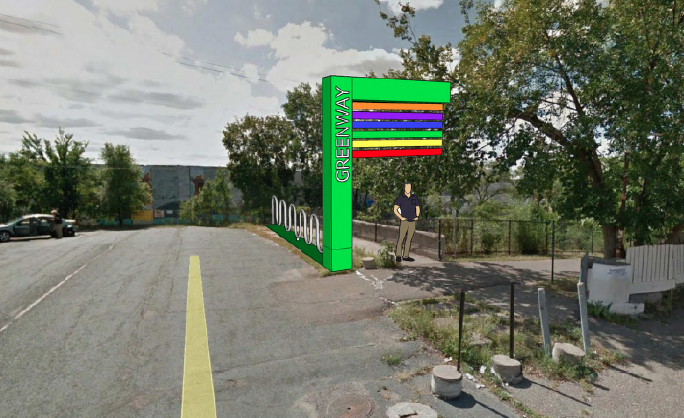 Signs can be pulled out into the community to connect people to the Midtown Greenway, and the wayfinding system could include opportunities for neighborhoods, with the help of local artists, to design system elements that reflect the local community. "Helping people find and feel welcome on the Midtown Greenway through inviting, culturally relevant signs and visual cues is important to making the Greenway a more equitable space," said Myslajek. The HGA design team designed different levels of intervention options, from minimum to maximum, to achieve wayfinding system goals. Painted sections near entrances and exits on the Greenway could address safety concerns and wayfinding issues at those points. Painting could be minimal, in one section only, or extend past the entrance and exit points and include painted vertical wall maps. The HGA team helped visualize how the bridges spanning the Greenway could assist with wayfinding. Bridges could be painted with the name of the street, or be painted different colors correlating to a neighborhood or area. At night, lights under the bridges illuminating the Greenway could address both safety and wayfinding issues. "I look forward to taking these design concepts to potential funders and to planners at the City and County as we further work to develop a wayfinding system that serves the Midtown Greenway and the surrounding communities," said Myslajek.